Back in December, I blogged about the Discovery Club, a beauty box filled with perfume samples. After completely falling in love with the Lancome scent and finishing the whole sample, I couldn't resist getting the full size bottle. As the Discovery Club provided a handy £5 off voucher, I thought it was the perfect opportunity to use it up. I gave it to my brother and he bought me the perfume for Christmas, hurray! La Vie Est Belle translates from French to Life Is Beautiful, which is such a lovely name for this perfume. The expression is according to Lancome is “A philosophy of life and happiness or universal declaration to the beauty of life”. I will admit, it’s quite deep for a perfume but enjoyable none the less! The perfume bottle is absolutely gorgeous in my opinion. The bottle looks very classy and is a welcomed addition to my growing perfume collection, especially with it’s cute little bow. I’d describe the scent as a floral, romantic fragrance. It isn't overpowering or sickly sweet but it’s definitely noticeable, I’ve had quite a few compliments while wearing it! I've been told it’s quite similar to Viktor & Rolf’s Flowerbomb perfume so if you like that you'll probably like this too. The main notes are: Iris Pallida, Jasmin Sambac Absolute, Orange Blossom Absolute, Patchouli Essence. I’d highly recommend this perfume if you love sweet, floral fragrances. I think it’s quite a versatile scent in my opinion so if you’re thinking of buying someone special some perfume I think this one would be a lovely choice. 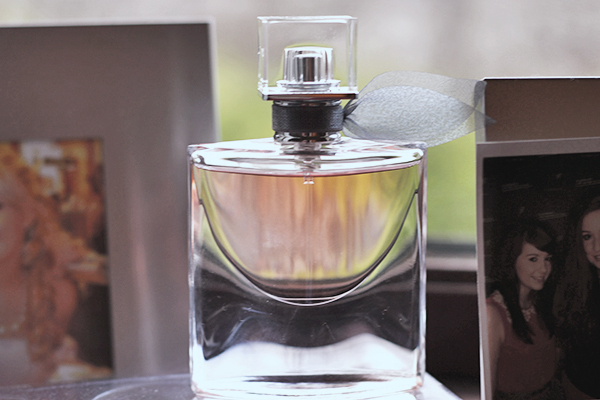 As it’s an Eau de Parfum, the scent lasts all day long so it’s definitely worth purchasing! I got a spray of this perfume back in August and i wasn't sure about it at the start. The little paper stick lay in my bedroom and gave off a beautiful scent. I loved it so much i went out the next week and bought a bottle. It's now my favourite perfume after years of wearing just CK Eternity. I love it.